Spending any significant sum of money by the City Council tends to attract the scrutiny of some ratepayers, especially if they’re dubious about the benefits to be gleaned from the investment. We’ve seen some of that with the planned expenditure on a convention centre and new stadium for example. Some people have also been questioning of the expense of the major cycleways (especially when the estimated costs for them jumped up recently). Assuming that such curmudgeons get past any mistaken belief that cyclists aren’t paying for it, the positive evidence on this one is actually fairly strong. A recent presentation at the 2WALKandCYCLE Conference in Nelson highlighted some recent work done to model and evaluate the benefits derived from implementing the Major Cycleways in Christchurch (including the central city transport improvements and the Coastal Pathway). A paper by local transport modeller Paul Roberts summarised the work undertaken. I have a copy of the full analysis report and it makes for interesting reading. The analysis relies on a “Christchurch Strategic Cycle Model” (CSCM) created in a similar way that many conventional transport models are developed for looking at motor vehicle trips. The CSCM uses information on demand for trips to determine when they might be undertaken by bike (e.g. shorter trips are more likely to be cycled than longer trips). It also works out which routes might used for cycle trips, e.g. quieter streets and links with existing cycleways are more likely to be preferred. In this way, a picture of the cycle traffic across the entire city can be determined. The next step is to work out the likely increase in cycling if the Major Cycleways are built. Based on various bits of research, it has been assumed that up to 30% of people currently using cars would switch over to cycling if the right environment was provided (many of the “Interested but Concerned”). Some growth in cycling numbers would be expected anyway (due to natural population growth, increases in fuel costs, etc), but the additional cycling trips can also be estimated. By 2041, that could translate to more than 20,000 extra cycle trips a day around the city, or an increase of ~30% (which personally seems on the conservative side). It’s interesting to see the effect of the Major Cycleways themselves on where the cycling occurs, according to the CSCM. 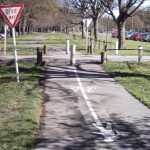 At present, only about 9% of all kms cycled in Chch are on protected cycle routes like pathways, with another 30% using cycle lanes. The introduction of the Major Cycleway network would see the bulk of the growth happen on these routes, to the point that nearly half of all kms cycled in the future would be on protected cycleways. The calculated benefits (relative to the base case) are calculated over 40 years and converted into “present value” costs, to reflect the fact that benefits earned some time in the future are not valued as much as the same benefits earned right now. All up, the total estimated benefits for the planned cycleways are $1.2 billion in today’s dollars. What’s really notable is that 28% of the benefits are for “decongestion”, i.e. benefits to people still driving, thanks to the shifting of others onto their bikes. We know already that there’s little truth to the belief that “cyclists don’t pay”, but this highlights the fact that everyone wins when we provide better cycling facilities. Interestingly, the estimated safety benefits only make up ~2% of the total benefits (although that is somewhat conservative). While the perceived safety benefits of the new cycleways are a key reason behind the increased numbers of people cycling, the current research is still relatively limited in the actual safety benefits (particularly because most crashes occur at intersections). Also, the reductions in crash risk per rider are somewhat countered by the increased numbers of people cycling, so the absolute numbers of crashes might not reduce much (even a “cycling paradise” like The Netherlands has ~180 cycle fatalities a year, simply due to sheer numbers). Even if the costs have blown out to ~$160 million, a quick calculation shows that the Benefit/Cost Ratio of the total cycleway programme in Christchurch is conservatively at 7:1 – a pretty good business case in most people’s eyes. A similarly high Benefit/Cost Ratio was also found in a recent piece of research looking at the effect of a full cycle network implementation for Auckland. Other studies have also shown the same kinds of high returns on investment elsewhere in the world too. Just for comparison, the much-vaunted Southern Motorway extension ended up costing $140 million for a projected Benefit/Cost Ratio of about 2.4:1 (I’m guessing that the likely benefits of the relatively small portion that went towards the parallel cycleways were much higher). It’s important to note too that the full cost of the Major Cycleways is not being borne by ratepayers. Like all worthwhile transport projects, NZ Transport Agency subsidises cycleways roughly equally for every dollar that the Council contributes. And the new $100 million Urban Cycleways Fund allows Councils to split the bill three ways, with an extra third coming from there. Christchurch has already picked up a couple of bits of interim funding and could be in line to get ~$25 million out of the Fund potentially. All of these calculations are of course only based on a model and, like all models, the CSCM involves a bit of crystal-ball gazing. But, if anything, the estimates and assumption seem conservative (in terms of cycling trips and benefits obtained), which augurs well for the merits of investing in the Major Cycleways. Do you think the Major Cycleways are a good investment? My guess is that the major cycle routes will also benefit local businesses as people who switch from car to cycle will have more money to spend locally. Much of what is spent on fuel, parts, vehicles goes overseas. People on bicycles can also frequent a local business on their route as stopping and parking are so much easier. With about 40% of our rates going to roading and about 70% of that just for maintenance the reduced wear and tear from people choosing bicycle over car will help ratepayers. Finally, many cities have found that they do not need to build hugely expensive roading projects for cars when more people choose to bicycle. Those who think cycle infrastructure is expensive are forgetting the far higher cost of building infrastructure for motorised vehicles. Am I able to use some of this data for a project on promotion of cycling in CHCH if I cite you and cyclingchristchurch.co.nz? No problem Jessica. In some cases, it might be better to cite the original sources referred to. It seems odd to me that the benefits to users have been limited to travel time savings (I may be reading that wrong). People switching from driving to cycling wouldn’t experience huge travel time savings, and for many it would mean increases in travel time. I would’ve thought that the main benefit (apart from health, which has been quantified separately) would be vehicle operating cost savings. Do you know if these have been accounted for anywhere?